Voles can destroy a garden, and often do as well as killing plants, shrubbery, and even spreading disease. Some people get confused whether or not they have mole problems, or vole problems, but they know for sure that they do have hole problems. We handle both types of rodents, and are able to identify what kind of problem you have, as well as be handle the problems that voles will cause. While moles will spend most of their time underground creating tunnels in search of food, voles will primarily will digging, uprooting, and eating the stems and the roots of flowers, plants, and small shrubbery. They appear often often the winter looking into yards of homes and businesses looking for food. Voles will actually often be referred as field mice, but they aren't mice at all. Some voles will spend time underground digging while fishing out dirt to fully uproot plants. Voles are nocturnal rodents and they also breed very fast. When there are more than a few voles, they can cause a ton of damage. If you see a vole, there are more likely more around. Voles or “garden voles” are small rodents apart of the cricetidae family and the rodentia order. Voles are often times mistaken for mice. Although the vole size is similar to mice, the tail length is what makes the two different. Mice will have long tails, roughly half the size of their body. Voles on the other hand have shorter tails, shorter than half the size of their body. Vole size varies, but typically the length of the rodents is anywhere from four to nine inches long in length. Vole tails are thin with dark fur. Most voles are dark in color, ranging from brown, black, or gray. Voles love to stay active during anytime of the day, but gravitate towards dusk and dawn. Much like the gophers, voles are experts at creating subterranean burrow networks. These burrow networks are created on the side of buildings or under the ground. 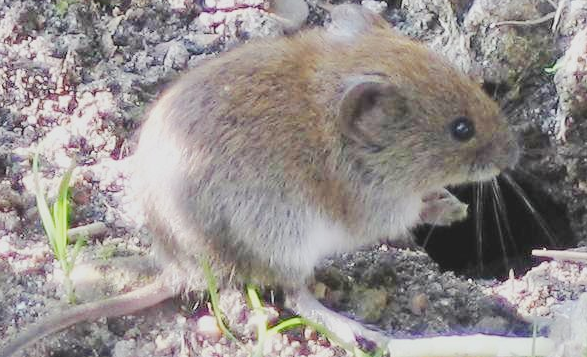 Vole burrows are very destructive, because it’s essentially a whole in the ground that has been created from digging. Along with burrows, voles are professionals at creating and connecting tunnels underground, much like the gophers. 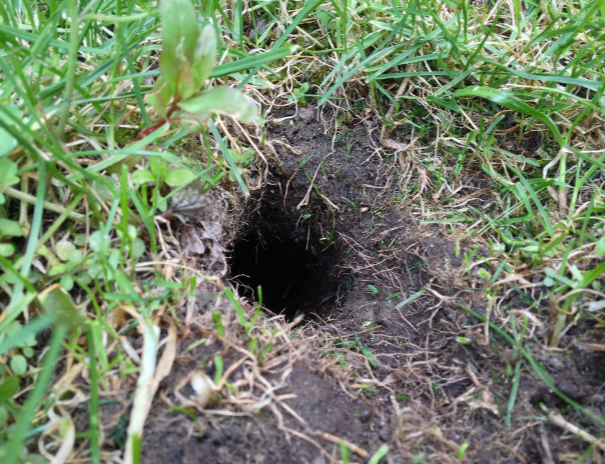 These vole tunnels can be very destructive because they will cut through surface agriculture in a garden or on a lawn. It is not uncommon for voles to use already created underground tunnels from moles and gophers. Voles are preyed upon by many wildlife animals like foxes, snakes, cats, owls, hawks, raccoons, and badgers. Sadly, the vole life cycle is very short due to the amount of prey dealt with on a daily basis. Voles will only live up to sixteen months in duration. Voles will heavily be found in grassy areas, or soft dirt surfaces. Voles like the gopher are also a problem when it comes to plants. Voles can be a problem in gardens, orchards, side yards, and backyards. Voles mate during anytime of the year, but the female vole will normally give birth during the warmer seasons of the year like the spring or summer. Each female vole will produce anywhere from two to five litters a year. Each vole litter will yield three to six babies. By the time the fall comes around the vole babies will be mature enough to take on life. Female voles will physically be able to produce offspring around the age of one. Voles live a short life, so reproducing is a constant matter. The sight of one vole on your property is enough to take action immediately. The biggest sign of a vole problem is when homeowners see voles running around from burrow to burrow. It is easy to know when there are many burrows, dens, tunnels, or networks because there will be visible destruction to your land, garden, or plants. Once you identify many vole issues, contacting your local vole exterminating experts is needed. Having a vole professional come out to your yard and inspect the problem will allow you to save time and money. Once the vole issues are diagnosed, the trained vole control expert will have the ability to implement any of the extermination methods effectively. Each vole case is different from the professionals point of view. 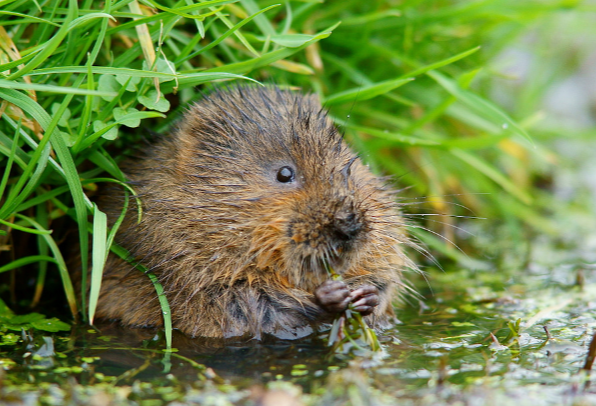 There are a lot of factors to consider when deciding on the best vole control option. Vole size, population, and habits will determine what is the best technique to use. Vole control companies like to use control methods such as: vole traps, vole repellent, vole poison, and vole bait. There is no one size fits all method. For many homeowners the best technique to exterminate voles from a property is to set up vole traps. Location is the most important thing to consider when setting up these traps. You could have the best vole trap, but if it’s set up in the wrong spot nothing will get done. To identify the best areas to set up traps, you must first find the right vole pathways. Vole pathways are what the rodents on a daily basis pass along. If you can set up a trap on one of these paths there is a high chance of catching a vole. Vole repellents are the next best strategy to implement on a property. Repellents act as fake food for the rodents. If you are a pet owner this may not be the best way to kill voles. The last thing you want is for your dog or cat to eat the wrong repellent and die. If you aren’t a pet owner than implementing the best vole repellent is a great option. Once the voles eat the poisonous repellent it’s hard for the rodents to not die, it’s science working. The toxic chemicals in the repellent will be enough to kill off vole communities. If you need a professional vole company in Walnut Creek, CA the best thing to do is give us a call today. Waiting till tomorrow to take care of any vole infestation problems is the wrong mindset. Our team of trained, professional vole exterminators have gone through the time tested obstacles everyone faces. Voles are small rodents to chase after. The most effective method to get rid of voles is to simply listen to the advice of the best vole pros in town.